Is This Australia’s Most Luxe Weekend Escape? Put that Swiss Alps Contiki Tour brochure down; you’re about to get schooled in the art of luxury long weekend vacationing that won’t cost you an arm, a leg, and a week's worth of annual leave. 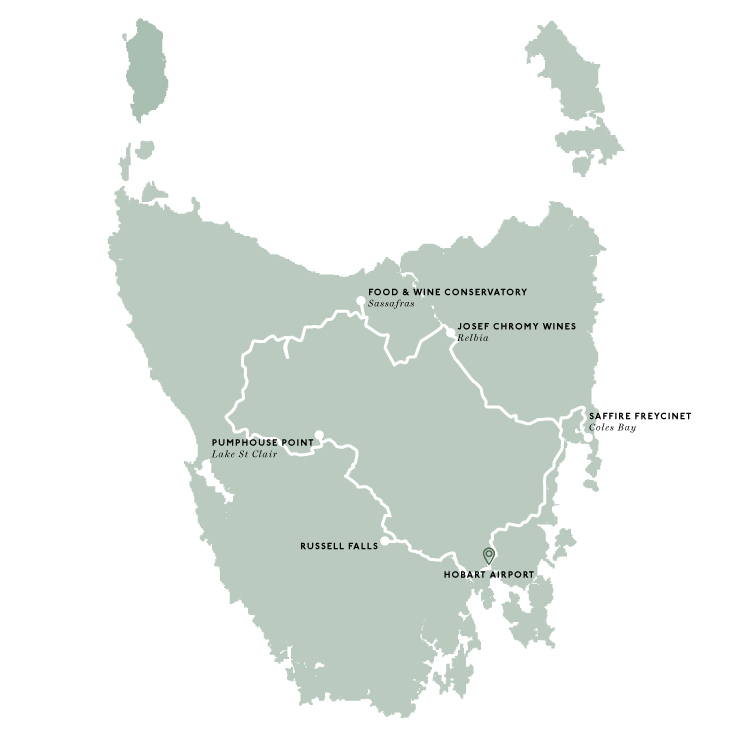 We’re not talking about some bespoke mountain-top village on the border of Widgiemooltha, we’re talking about the entire freaking state of Tasmania—because why limit yourself to a small town when you can have the whole damn island. Tigerair has just launched a brand new direct route from the Gold Coast to Hobart, which means ritzy weekend getaways to Tassie are even more in reach and affordable than ever before. But chuck ‘best places to visit in Tasmania’ in a Google search and you’ll be scrolling through gourmet eateries and boutique distilleries until this time next week. Fortunately for you though, we’ve just pre-prepared the most luxe weekend getaway itinerary imaginable so you don’t have to. So, grab your mates, book your flights and dig out your passport (just kidding, Tasmania is NOT a part of New Zealand) because the most luxe weekend of your life awaits. Three words: luxury coastal sanctuary (that won't cost you an arm and a leg to get there). That's right, nestled on the stunning east coast of our favourite island oasis is a five-star hotel that has more positive reviews on TripAdvisor than the entire state of South Australia (probably). Just over two hours from Hobart Airport is Saffire Freycinet; the crown jewel of Tasmania’s accommodation scene. It boasts not only a world-class overnight experience, but it also has a spa, gourmet restaurant and 1950s-style lounge where you can enjoy delicious local produce around the clock. 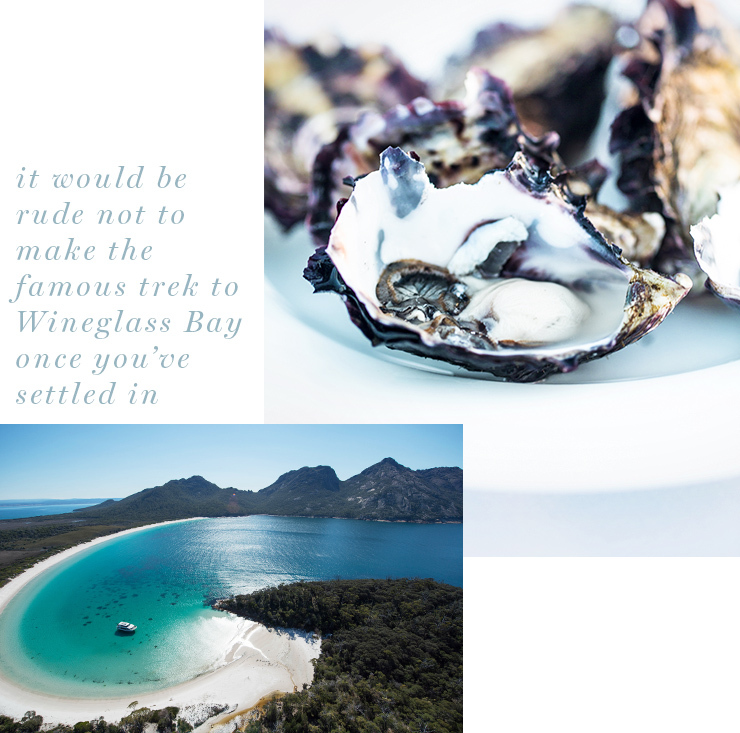 Of course, it would be rude not to make the famous trek to Wineglass Bay once you’ve settled in (i.e. had a wine on the balcony), too. Next on the itinerary, and just outside of Launceston, is Northern Tasmania’s most iconic gourmet winery and restaurant, Josef Chromy Wines. Tip: throw on a pair of wedges or dress shoe before you step through Josef Chromy’s doors because this is one eatery worth getting ritzy for. Each dish served in the immaculate restaurant space is made with the freshest ingredients, while their cellar door offers no less than three award-winning labels for you to taste. Plus the entire place is set among rows of lush vines. Anyone looking for an idyllic spot to pop the question? Do it here. Anyone who goes to Tasmania and doesn’t visit Cataract Gorge isn’t doing Tasmania right. This breathtaking spot is basically a Facebook cover photo waiting to happen with its historic Victorian fernery intermingled with the native oak forest. There are numerous short walks to enjoy (for those of you getting a bit stir crazy in the car), plus there's a swimming spot here known as Launceston Beach—just don't visit in winter if you're braving the waters. Oh, and it's less than two-minutes drive from central Launceston! Seriously. The aptly named The House at Quamby Home is stunning. Like, jaw-droppingly stunning. Built in the 1870s, the luxurious structure is tucked away on 312 acres of English garden and farmland in the Meander Valley, just outside Launceston. If you only eat one dish during your luxe weekend escape in Tassie, make it the Gourmet Tasting Platter from the Tasmanian Food & Wine Conservatory. The entire plate gets carried out by two staff members, is about the size of a small tractor tire and comes loaded with insane local produce such as cheeses, fresh fruit, seafood, bread, and preserves. Their extensive menu also has scrummy brunch items, lunch dishes, share plates and delicious drops of wine, beer and spirits from all over the state. 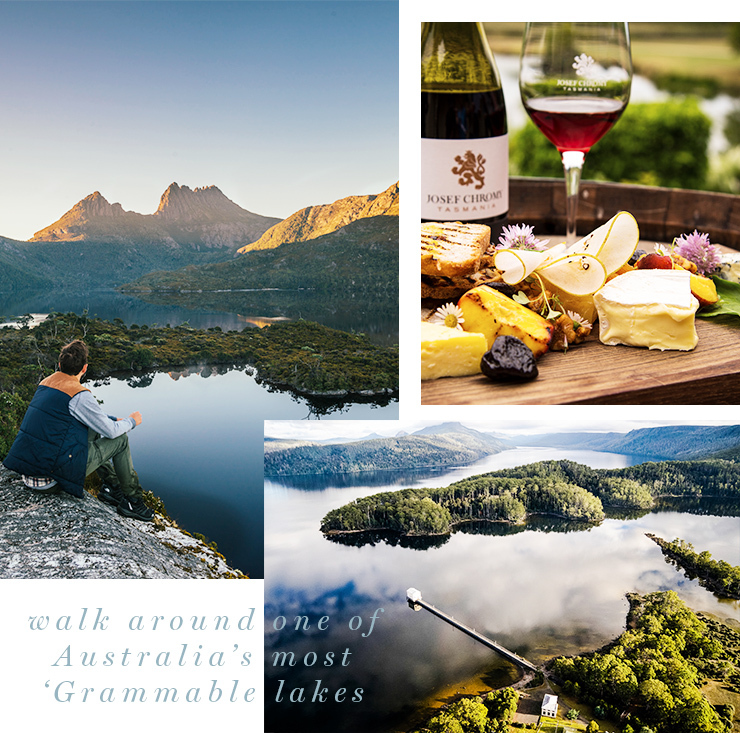 Joining Saffire Freycinet as the crème de la crème of Tasmanian accommodation is stunning wilderness retreat, Pumphouse Point, at Lake St Clair. This intimate haven in the heart of World Heritage wilderness is the ultimate in #nature experiences. You can choose to stay in either the Shorehouse, the Pumphouse, or the Retreat (which is a whole new level of self-contained luxe), but quite honestly it doesn’t matter because you could sleep in your car and still have the most incredible experience of your life. Plus the backdrop to your stay is a little summin’ summin’ often referred to as the most spectacular landscape on the planet. The best part though, is that there is bread on call 24/7 here—it's served warm with butter and it's out of this world delicious. Russell Falls is one of the prettiest spots in Tasmania. So it really is the most fitting way to end to your trip! Stop by on your way to the airport (leave plenty of time!) and soak up stunning scenery before you fly back to your 9-5. The walk is around 20-minutes and is the perfect farewell, if you ask us! Did you really think we'd let you have a chill last day on holidays!? No sir. 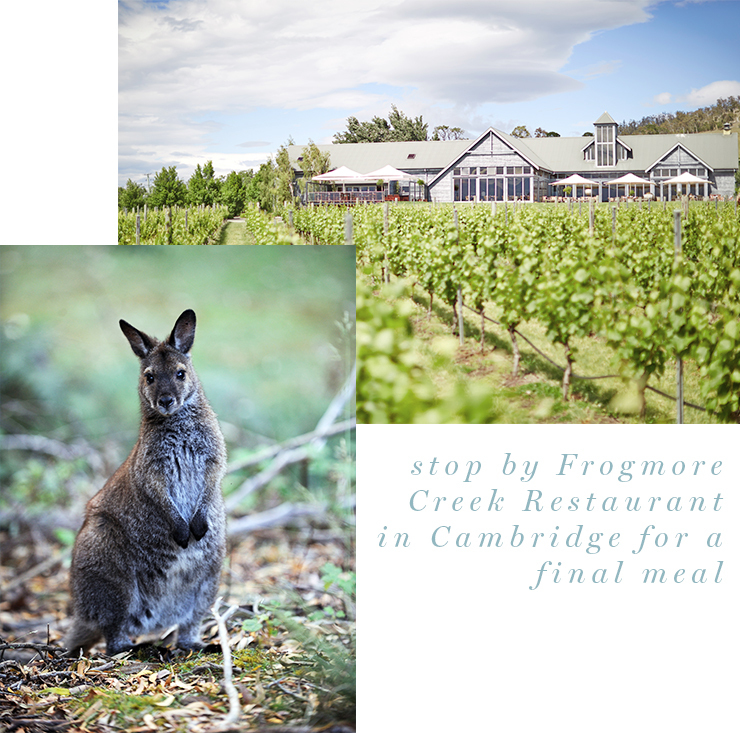 En route to the airport stop by Frogmore Creek Restaurant in Cambridge for a final meal. The restaurant sits amongst the stunning vineyards of Frogmore Creek, so you'll want to leave plenty of time for photo-snapping. Our tip? Hit up their Instagram beforehand and start planning your menu selection. So, started charging your camera yet? Tigerair now flies direct from the Gold Coast to Hobart, so check out tigerair.com.au to snavel up a flight deal.